Over this past weekend, I spent two days at the National Catholic Bible Conference that was co-sponsored by Ascension Press, Archdiocese of Philadelphia, and Augustine Institute. The conference was held at the National Shrine of Our Lady of Czestochowa in Doylestown, Pennsylvania. 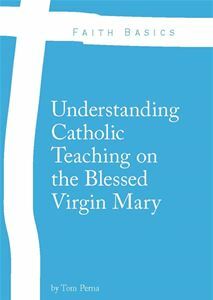 While I was volunteering at the conference, I realized that I had never written on this great Marian feast day. At one point in the history of Constantinople, Saracen invaders attacked the city, however they became very frightened and fled after the people carried the picture around the city in procession. St. John’s image of the Blessed Mother remained in the city for nearly 500 years. Eventually, it became part of dowries and was taken to a region of Eastern Europe that became known as Poland. Determined to keep the image from being attacked any longer, St. Ladislaus decided to bring it to his birthplace. As his entourage stopped to rest in the town of Czestochowa, the sacred painting was placed in a small wooden church named for the Assumption of Mary nearby Jasna Gora (“bright hill”). As St. Ladislaus was ready to set out the following morning, the horses that carried the image on a wagon refused to move. He took this as a sign from Heaven that the image of the Blessed Mother was to remain in Czestochowa. On August 26, 1382, he enthroned the image in the Church of the Assumption. St. Ladislaus wanted the image to be protected and guarded by the holiest of men. He asked the Pauline Fathers to take on this mission. They continue to protect the image to this day (even at the “American Czestochowa” in Doylestown, PA). Although Our Lady’s image was attacked previously, more attacks would come upon it. Followers of the heretic priest, John Hus, attacked the Pauline monastery in 1430 and destroyed the sanctuary. The Hussites stole the image and placed it in a wagon, but as before, the horses refused to move. Getting frustrated because the horses would not move, they threw the painting on the ground. The image broke into three pieces. One of the pillagers drew his sword and slashed the image twice causing two deep gashes. In some circles, it is said that the image bled from these marks. While trying to cause a third slash, the man endured great anguish and suddenly died. The two slashes on the cheek of the Blessed Virgin and the mark from the arrow on the neck have always been depicted on the image. Even after artists try to repair them, the slashes continued to just reappear. In 1655, a band of 12,000 Swedes ventured to destroy the image. The 300 men who were protecting the image battled the vandals and routed them out. In 1656, the Holy Virgin was announced as the Queen and Protector of Poland. During World War II, 500,000 Poles made a pilgrimage to the city of Czestochowa in defiance to Hitler’s orders that stated that all religious pilgrimages had to stop. After Poland was liberated from Nazi rule, a million and half people gave thanksgiving to the Blessed Mother by praying before the sacred and miraculous image. In 1948, as the entire nation of Poland was held captive by Communist Russia, nearly 800,000 courageous Poles made a pilgrimage to the city and sanctuary of Czestochowa on the Feast of the Assumption. As they were on pilgrimage, they had to walk through Russian soldiers that kept watch over the streets. 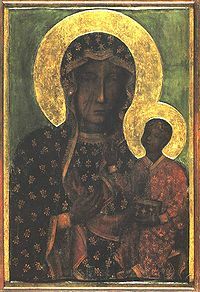 The Black Madonna to this day is honored by not only the Polish people, but even in America at the Shrine in Doylestown, PA on August 26. It is known as the Black Madonna because of the dark colors on Our Lady’s face and hands. The color is ascribed simply because the image is old but also because it was kept in places where the smoke of votive candles changed the pigmentation of it. Over the centuries, the Popes have made statements in favor of the sacred image. In 1717, Pope Clement XI gave his papal recognition to the miraculous image. There was a physical crown given to the image during the first official coronation of the portrait, however it was stolen in 1909. Pope Pius X replaced it with a gold one encrusted with jewels. Blessed John Paul II, a Pole himself, made pilgrimages and spoke about the image during his Papacy. He visited the shrine in America twice. In recent years, Pope Emeritus Benedict XVI also visited the pilgrimage site in Poland. 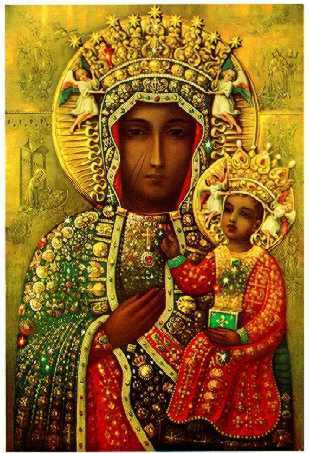 Let us pray and ask for the intercession Our Lady of Czestochowa – The Black Madonna, that we may be protected from evil people who seek to destroy us and our Catholic faith as the image that bears the face of the Blessed Mother has been guarded over the years. As Queen Mother, we ask for her to bring our intercessions to her Heavenly and Kingly Son, Jesus Christ. Amen. Our Lady of Czestochowa…Pray For Us! What a great story! 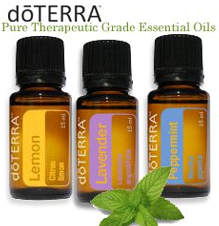 Doylestown PA now on our list to visit!!! With all due respect to your deep devotion to the Virgin Mother and to the “Monday with Mary” tradition, don’t you think that some notice should have been given to the nativity of John the Baptist today? Frankly, I for one would very much appreciate your thoughts on this event and its significance to us and our church in this day. If John was the last of the OT prophets and the only prophet of the NT, there must be something for us to learn from that. Can I expect another blog posting soon? Mondays with Mary is what I do on this day. I am sorry if you were looking for a write-up on St. John the Baptist, but other bloggers wrote about him. Another blog post on him? Yes, next year. I love this image and have seen it in Poland! Thank you for encouraging devotion to Our Mother!